When learning how to make pancake and waffle recipes you will find that they are quick bread batters cooked over direct heat. Pancakes vary from hearty buckwheat cakes to delicate crepes Suzette. 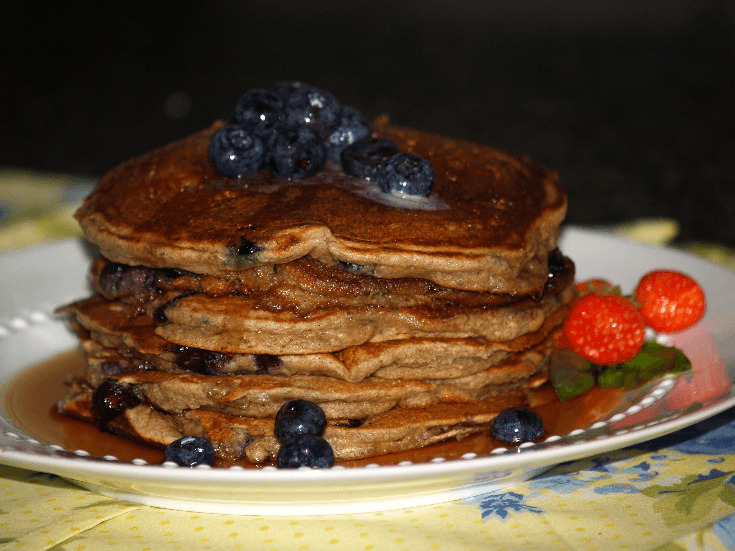 Pancakes should be light, tender and uniform in color; a light golden brown. They may be thick or thin but they must be thoroughly cooked throughout. The proportion of the ingredients will determine whether they will be thick and porous or thin and moist. Generally speaking, the stiffer the batter, the less pancake batter should be stirred. Too much stirring will make tough and soggy cakes because it develops gluten and causes a loss of the leavening power. When the batter has to stand before being used, the baking powder should be increased because they lose leavening as they stand. NOTE: After I learned how to make pancake and waffle recipes, I have always used for the leavening “double acting baking powder” in all my recipes calling for baking powder. The leavening of single acting baking powder takes place when it is combined with liquid. Double acting baking powder leavening takes place two times; once when it is blended with liquid and the second time when the recipe is heated. If pancake batter has to set, the leavening power will begin again when the batter is pour in a hot skillet or griddle. I prefer a griddle to cook pancakes on over a skillet primarily because you can cook more at one time. The griddle should be uniformly heated so that the cakes will brown evenly. Since I have learned how to make pancake and waffle recipes I have sprayed the griddle or waffle iron with vegetable oil. Depending on the size of pancakes you like, measure the same amount of batter for each to make them uniform in size. Turn the cakes over only once when they look slightly dry around the edges. Serve immediately while still hot. In a large bowl combine and mix flour, baking powder and baking soda. Add blueberries to flour mixture: toss with fork to coat. In another bowl combine egg, buttermilk, 1 tablespoon oil and honey; mix well. Add egg mixture to flour mixture; stir to blend well. NOTE: Mixture should be thick but if it is too thick add a little more buttermilk. Measure ½ cup batter onto hot oiled griddle or skillet; spread batter into circle (3-4 inches). Brown a few minutes and turn cakes over 1 time to brown on other side. Pancake and waffle recipes are cheap foods to feed a family. This hearty recipe is large enough to have some today and some tomorrow. Combine in a large mixing bowl the flour and next 5 ingredients. Beat in the eggs, buttermilk and oil until well blended. NOTE: PREHEAT GRIDDLE to 350F degrees. These are hearty hot cakes and should cook on a little lower temperature for a little longer than other pancakes. NOTE: If the batter seems a little too thick adjust by adding a slight more buttermilk. Gently fold in the berries; cook on hot oiled griddle 1/3 cup batter for each cake. When hot cakes appear bubbly and drying on top turn over and cook on other side. A basic pancake and waffle recipe should be on hand in every kitchen for a quick breakfast or treat! Sift and measure flour; combine flour, baking powder, salt, sugar and sift again. Combine egg, milk and melted shortening; pour into flour mixture. Stir only until dry ingredients are moistened; cook on hot griddle. Apple Pancakes: Increase sugar to ¼ cup adding 2 tablespoons of the sugar to 1 cup chopped apples. Sift remaining sugar and ¼ teaspoon cinnamon with the dry ingredients. Fold sweetened apples into batter before cooking. 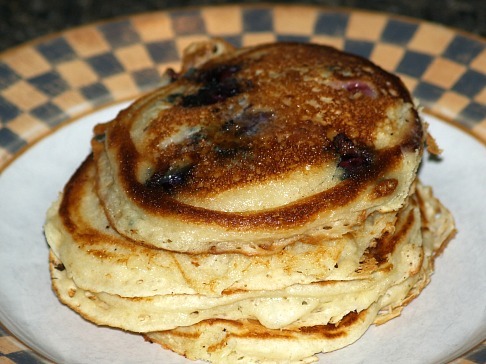 Blueberry Pancakes: Increase sugar to ¼ cup adding 2 tablespoons of the sugar to 1 cup blueberries. Sift remaining sugar with the dry ingredients. Fold sweetened blueberries into the batter and cook. 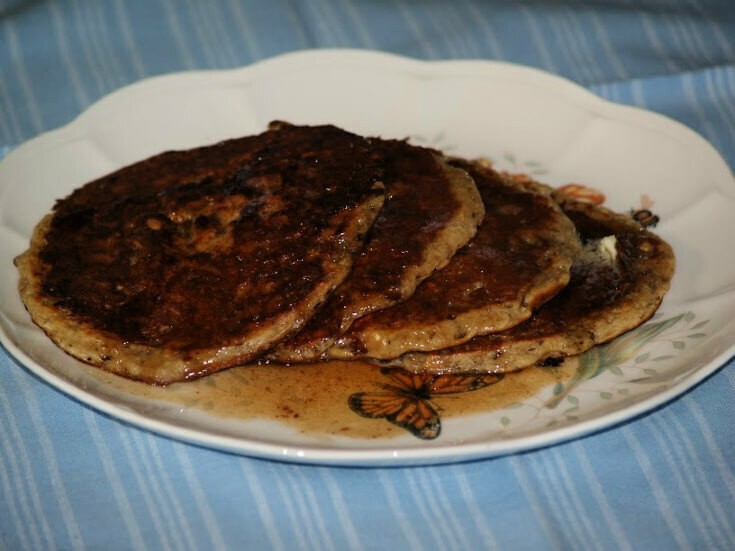 Banana Nut Pancakes: Fold in 1 large banana thinly diced and ¼ cup chopped walnuts and cook. Chocolate Pancakes: Increase sugar to 1/3 cup. To the liquid ingredients add 1 square unsweetened melted chocolate. Cook and serve with sweetened whipped cream for a dessert. Corn Pancakes: Add 1 cup canned and drained corn to the liquid ingredients and cook. This makes a great lunch served with grilled ham or sausage. When it comes to pancake and waffle recipes, it is always good to find a more savory recipe. Some of these like the following one can be very delicious. Combine biscuit mix, egg and milk; beat until smooth. Melt butter on griddle; drop batter by 1/3 cup on hot griddle. Cook over low heat until rim of pancake is full of broken bubbles; turn and brown on other side. Combine spinach, salt, pepper and nutmeg; spread a little mixture on each pancake and roll. Place spinach rolls in a greased baking dish. Heat evaporated milk and cheese until cheese melts; pour over pancakes. Bake at 400F degrees for 8 to 10 minutes or until lightly browned. HOW TO MAKE WAFFLES: Pancake and waffle recipes should both be cooked to an even brownness. Also like the pancakes, waffles should be uniform in size and they should be light, crisp and tender. I also spray the waffle iron with non stick oil spray like I do the griddle. The correct baking temperature is important. If the iron is too cold, the waffles will stick or appear spotted. If it is too hot, the outside will brown before the heat has had a chance to penetrate and cook the inside. A moderately hot temperature, correct for plain waffles, has been reaches when a few drops of cold water placed on the hot grids immediately form into white balls and dance around. For special batters like the chocolate, the waffle iron should be slightly cooler. It will be just right when a few water drops on the grids slowly bubble and boil away. Pour the batter from a pitcher onto the waffle iron to about 1 inch from the edges. After closing the iron, the batter will expand and fill the grids. After making a couple, you will find just the right amount of batter needed. I always like to have a basic pancake and waffle recipe easy to access for a quick breakfast. Sift and measure flour; add baking powder, salt, sugar and sift again. Beat egg yolks, milk and melted shortening; pour into dry ingredients and mix just to moisten. Bake 4 to 5 minutes in a hot waffle baker until golden brown. Pecan Waffles: Add ¾ cup chopped pecans to waffle recipe. Serve as dessert with ice cream and butterscotch sauce. Spice Waffles: Sift 1 teaspoon cinnamon, ½ teaspoon allspice, ½ teaspoon cloves and ½ teaspoon nutmeg with dry ingredients. Increase sugar to ¼ cup and increase milk by 2 tablespoons. Blend and cook. Orange Waffles: Decrease milk in recipe to 1 cup. Add ½ cup orange juice and 2 teaspoons grated orange rind. Blend and cook. Fig Waffles: Add to dry ingredients 1 cup chopped dried figs. Serve for dessert with ice cream. As you can see, pancake and waffle recipes can both be used for wonderful desserts. When my children were all still at home, I would often make plain waffles and top them with cherry pie filling and whipped cream for a quick dessert. This is delicious! 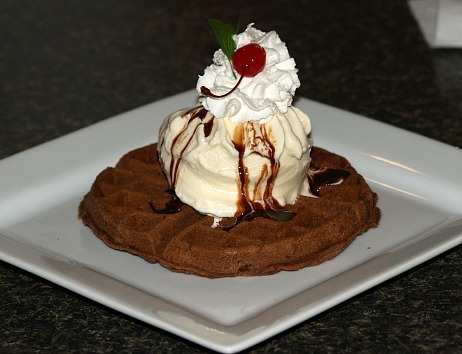 Below is a great brownie waffle for desserts. Sift flour and measure; add salt and cinnamon and sift again. Cream shortening and sugar until light and fluffy; beat in yolks. Add milk alternating with the dry ingredients; add chocolate and nuts. Bake about 5 minutes in a waffle iron slightly cooler than plain waffles. Cut into wedges and dust with powdered sugar. Serve topped with ice cream and chocolate sauce topped with unsweetened whipped cream.